The collection “E Ka Kush e Ka” seeks to include children and adults in a series of books and games through which they discover and rediscover cultural heritage as a bridge, linking us to the complexities of the world around us. Cultural heritage is not only about learning facts; it is an ideal educational and entertaining support for learning about and exploring new things, other people and our society. It is an instrument that helps with self-reflection, skills and mental vivacity… a path toward citizenship and mutual respect, where the search for meaning is foremost. The collection is also being used for the Heritage Ateliers. These activities are aimed at children and combine site excursions with hands-on classroom sessions. Since 2014 CHwB has held Heritage Ateliers in several Albanian cities for hundreds of children, teachers and parents. 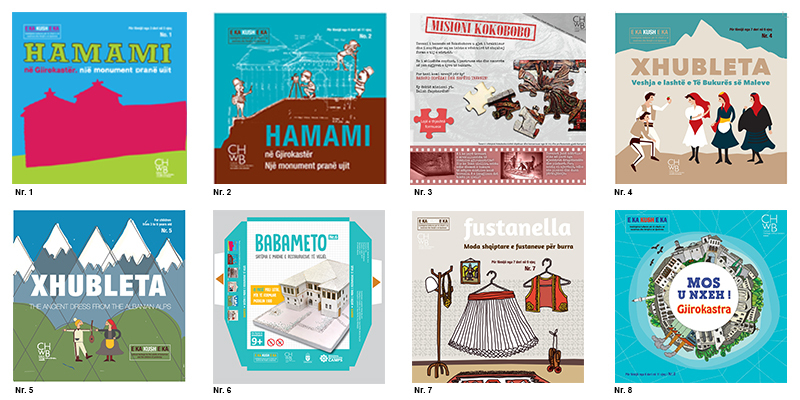 Would you like to try out the simplified version of the Mos u Nxeh – Gjirokastra game? First print the 4 pieces and glue them together; then grab a dice and 4 buttons of different colors and you are good to go. Finally you can send us your feedback by contacting us at gro.b1555963356whc@a1555963356inabl1555963356a1555963356.